Josh Krajnal, a developer and Senior BPA from India has developed a unique and interesting online tool Twaps to search the most recent hundred tweets by location. Twaps, a mingle of Twitter and Google Maps is designed to show the publicly available 100 recent tweets with in a 3.2 kilometers radius of your pointed location. The another good thing about Twaps is that it's free and doesn't required any sign-in neither in Twitter or nor in Google maps. 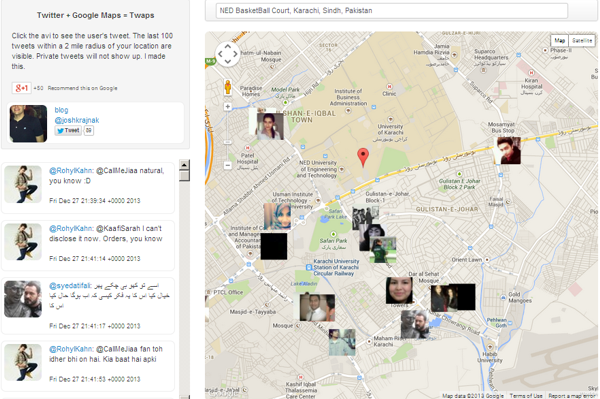 To start finding tweets you just have to visit itsatwap.com and then type the location in the embedded Google maps search bar. With in seconds exactly the hundred recent tweets by random user's tweeted within a two mile radius of your typed location will go visible on map with users profile photos and also in a left sidebar with details. The tweets will not go visible which are protected and with disabled tweet location feature. You can alter these settings from your account's Security and Privacy section in twitter.